Geothermal energy is an internationally recognized clean, sustainable and renewable source of affordable heat and power. It is obtained by pulling hot water from deep below the earth’s surface and running it through a turbine to produce electricity with low or no emissions. After the hot water is used to make clean electricity, and before the water is reinjected, the remaining heat can be used for a variety of commercial, industrial, or entrepreneurial endeavours, including fish farming, greenhouse heating, district heating, pasteurization, material drying and snow melting. The experience of countries around the world shows us the great potential of geothermal heat and power. With legislative and regulatory support, we can harness the potential of geothermal here in Canada, and use it to create reliable green energy, jobs, and economic prosperity. As a voter in your constituency, I’m contacting you to let you know about Canada’s Geothermal potential, and to advocate for its use. 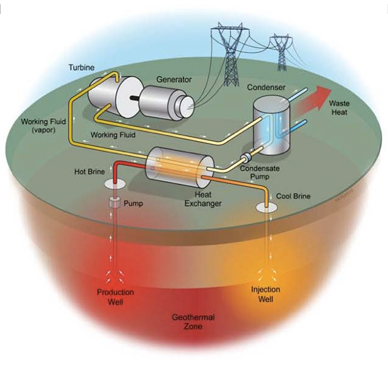 Geothermal energy is the Earth’s own internal heat, and is incredibly versatile. Some examples of its uses include: greenhouse agriculture, refrigeration, space heating, tourism, and electrical generation. While particularly visible in the western provinces, geothermal resources are found throughout all of Canada. With this renewable form of energy, we can use Canadian expertise in sub-surface resource development to create sustainable and permanent jobs. There is now a critical opportunity to expand our country’s green energy and economic growth. More action is needed to help level the playing field for geothermal developers, above and beyond the steps already taken in Budget 2017 & 2018. In addition to the changes needed on the Federal level, the Provinces and Territories can play an important role in helping to level the playing field for the geothermal industry. Local geothermal developers are in need of a more robust Provincial regulatory framework, as well as direct support matching that which other renewable energy sources such as wind and solar receive. I strongly encourage Provincial or Territorial representatives reading this letter to contact the Canadian Geothermal Energy Association (CanGEA) for further details on the specific policy needs of geothermal developers in your area. Improved data coverage would help developers better understand Canada’s geothermal resources. Geothermal developers can become full and effective players in Canada’s renewable energy future if the right changes are made. 1. The Government of Canada should commit to sourcing 100% of heat used in federal buildings from clean sources by 2030 as part of the Greening Government Services Plan. Sourcing clean, renewable heat for all federal buildings and operations, in addition to clean electricity, is a realistic and achievable option for the Government of Canada to meet its GHG reduction goals. 2. Geothermal drilling risk reduction programs have a proven record for increasing project developments globally; developing a drilling risk reduction program, in Canada could help accelerate the development of Canada’s geothermal energy industry. 3. That the Government of Canada should allocate further funding to Environment and Climate Change Canada for public geothermal energy literacy education initiatives and for youth renewable energy curriculum development. A well-informed populace is key to moving forward with renewable energy project developments and to meet Canada’s GHG reduction goals; providing support for renewable energy literacy workshops and for youth curriculum development will go a long way in bringing Canadians on board with our current plan to mitigate climate change. 4. That the Government of Canada should create a one-stop-shop for government funding and financing options that would allow companies to develop and build a profile consisting of past applications, any completed due diligence processes and other relevant information; all in one accessible portal. Allowing companies with proven merit to be fast-tracked through government financing and funding application processes through the creation of a one-stop-shop portal would increase accessibility and reduce the amount of work for applicants and applicant reviewers. 5. That the Government of Canada should increase the amount of funding for all existing renewable energy funding programs. Further funding and intake rounds for the existing renewable energy funding programs will promote the development of more opportunities for all developers and will contribute to reducing GHGs in Canada. These 5 recommendations would help promote the development of clean, reliable, and affordable geothermal energy development in Canada. Climate change mitigation and clean growth are both better served by increased government support for geothermal heat and power. When the opportunity comes for you to comment on programs and regulations, in provincial or territorial legislatures, and particularly as the 2019 Federal Budget is drafted, I ask that you support geothermal by making sure the recommendations written above are present so that Canada can be a richer, more sustainable place. Your postal code and province are required to select your local elected officials that will appear below. A copy of the email will also be sent to the Prime Minister, Federal Minister of Natural Resources, Minister of Finance, Minister of National Revenue and Federal Minister of Environment and Climate Change as well. powEARTHful is a public engagement initiative of the Canadian Geothermal Energy Association (CanGEA). CanGEA is the collective voice of Canada’s geothermal energy industry. As a non-profit association, we engage in advocacy and public outreach efforts that promote the exploration and development of geothermal resources in Canada. Geothermal energy can provide competitively priced, renewable, round-the-clock energy in Canada. Be part of the change. Be powEARTHful.